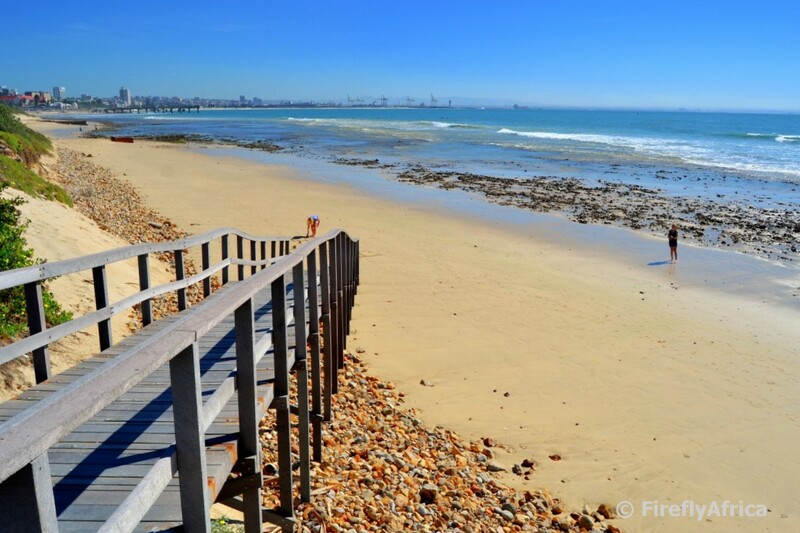 I don't think it matters if its summer or winter, living in Port Elizabeth means that the beach is always calling. You don't have to go swim to go to the beach, just go for a walk or lets the kids run free a little. On 25 April we celebrated World Penguin Day. Here in Algoa Bay we are very fortunate to have the biggest breeding colony of African Penguins on St Croix Island. But we're not just fortunate to have them here, we are thus also aware of the desperate plight of the African Penguin. Penguin numbers have plummeted since the 1980's with only around 18000 breeding pares left out in the wild. As a belated celebration of World Penguin Day, I'm posting this rather awesome video by Volkswagen and the Dyer Island Conservation Trust. It may not have been shot here in Algoa Bay, but it could just as well have been and have a lot of relevance to our penguins as well. 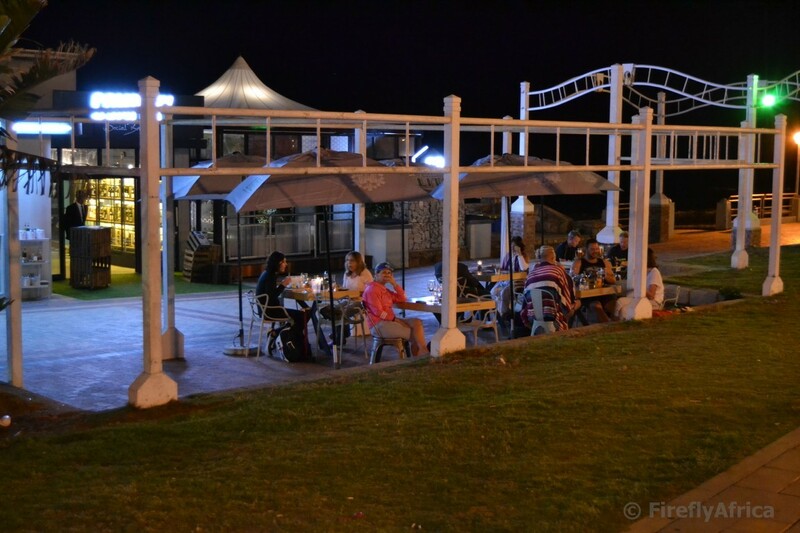 A new restaurant recently opened in the McArthur's Pool complex. This post isn't about the restaurant as I don't even know what its name is, but rather about the people who sat outside having a meal or drink on the evening of Ironman. The new series of Game of Thrones may have started this week and yes, over here winter is also coming, but we're still having fits of good weather and some people are still enjoying the beach a bit before it gets too cold to do son. This row of colourful houses in Alfred Terrace, Central always fascinate me. 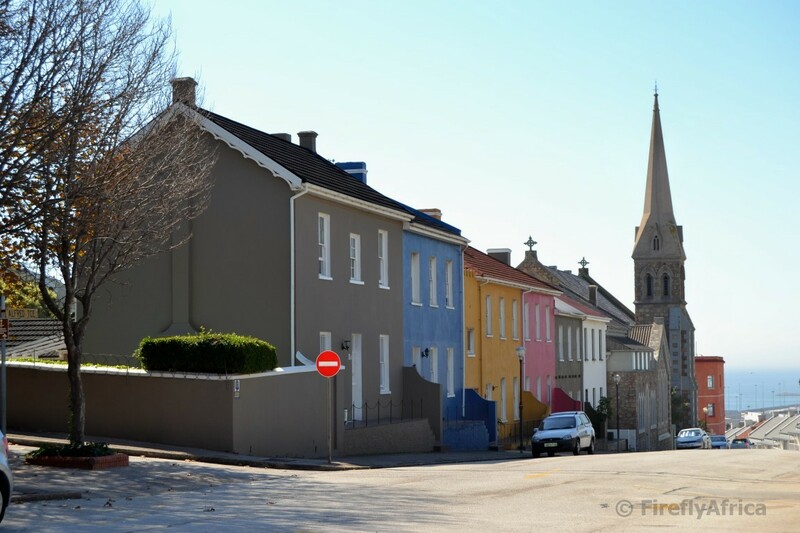 It shows that if all the old Settler homes in the area gets a proper revamp and a lick of paint that we can have our own colourful historic area like the Bo-Kaap in Cape Town. The only difference will be that we will have old stone churches rather than mosques. How about it? What do you think? Last week while attending the launch of Algoa Bay as the Bottlenose Dolphin Capital of the World I sneaked outside for a quick photo of the Yacht basin and the harbour lights. 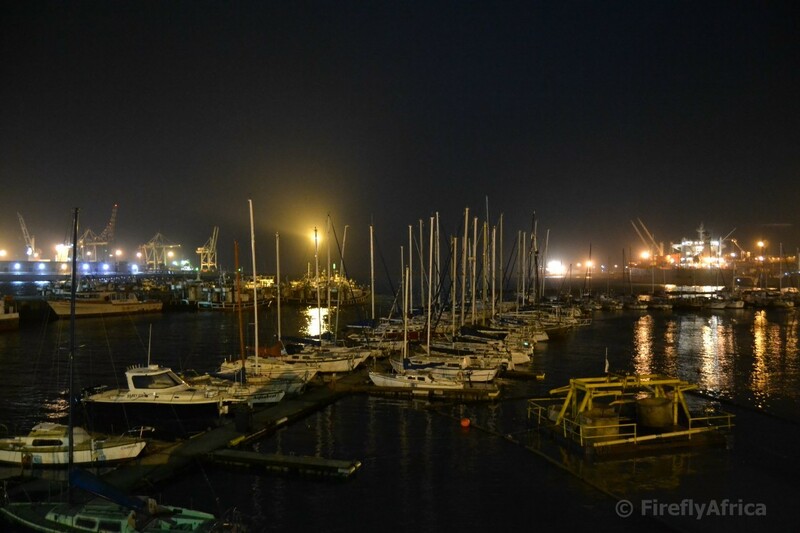 Wish one could get onto more areas in the harbour to take photos. 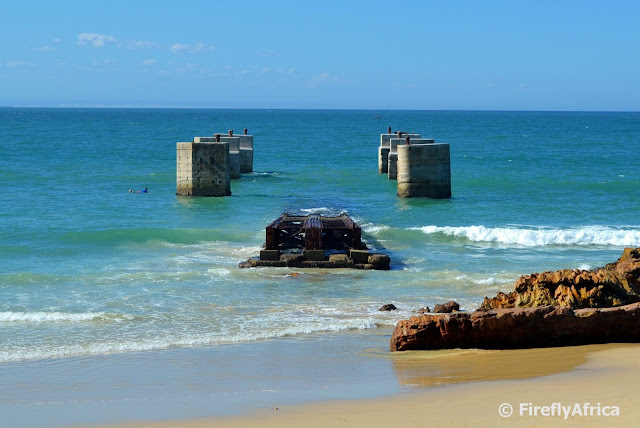 I know I've posted quite a few photos of the Humewood slipway before but as it is one of the best known landmarks along the PE beachfront I am sure I will still post many in the future. I hear rumours that there are big plans afoot to possibly include them in an iconic art project in the near future but I have heard such talk in the past as well. Hopefully this time it will actually happen. A little Geocaching detour allowed me to take notice of something I have passed many times before. Have you ever driven down Conynham Road in Parsons Hill and noticed the abandoned tennis courts on the right next to St Peter's Greek Orthodox Church. I've noticed them but I've never taken notice till this week. 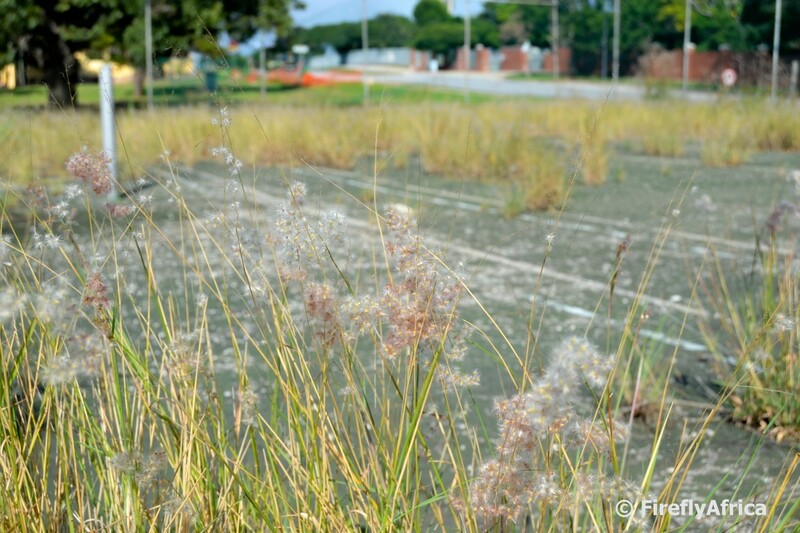 I wonder why the courts wasn't used anymore which led to it falling to ruin like this. 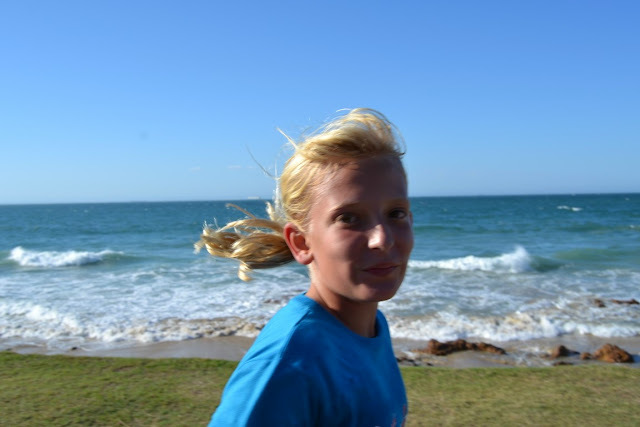 Sarah and Ralph from Chasing the Rainbow dragged the kids (ok, so they did go willingly but you know teenagers) off for a hike through The Island Nature Reserve just outside Port Elizabeth last weekend. I've done the Bushbuck Trail through the reserve and it is one of my favorite trails in PE. Check out the video they made and then head over to their blog and read the post by clicking the link above. A couple of years ago I got an inquiry to find out if I had any information on the "wedge building" near the Donkin Reserve in Central. After doing a bit of research and not finding much, I posted the question on the ExPE 60's 70's and 80's page where I received a wide range of opinions and answers. And then it happened, first hand information. Elizabeth Wilson Botha gave the following answer. This block of four flats (two at street level & two upstairs) is called Pineview on the corner of Ivy Street & Alfred Terrace. It was built in 1928. Our family owned it for 39years from 1968 - 2007. My late parents occupied the top corner flat. The bay window is the bedroom area, fitted out with dressing table & built-in cupboard along the back wall with the bed situated behind the dividing wall separating the bedroom & lounge. The passage, kitchen & bathroom are at the front door. Incidentally, my Dad made the two Edinburgh lamps at the point & entrance to the flats. My folks were from Edinburgh, Scotland! Unfortunately no mention of architectural style is mentioned in the plans, we still have! I saved the reply but totally forgot about it till stumbling on it last week. Had to go and grab a picture or two and share it with you. Since taking over PE Daily Photo (which has been over 7 years already), I don't think I've posted a photo of the Greek church in Parsons Hill yet. Every time I pass it I think I should stop but always either didn't have my camera or didn't have time. This week I passed again and had both some time and my camera. 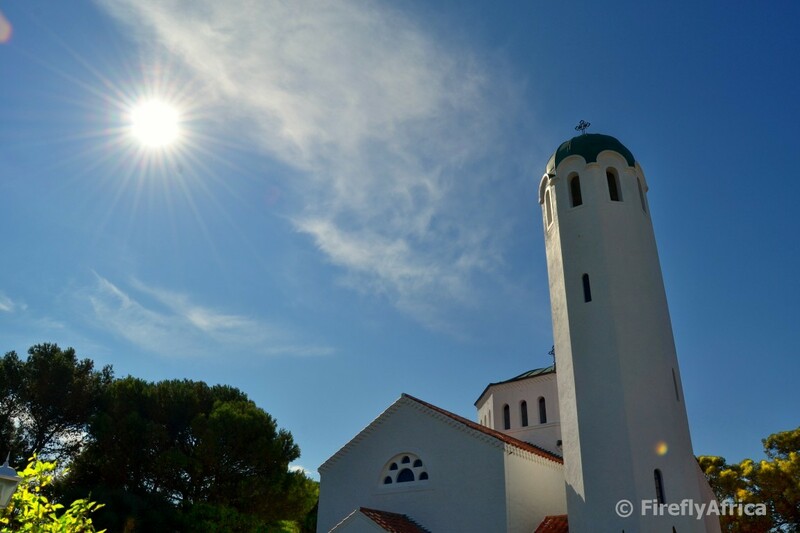 The church is the St Peter's Greek Orthodox Church and the well known Hellenic Hall is also part of the complex. 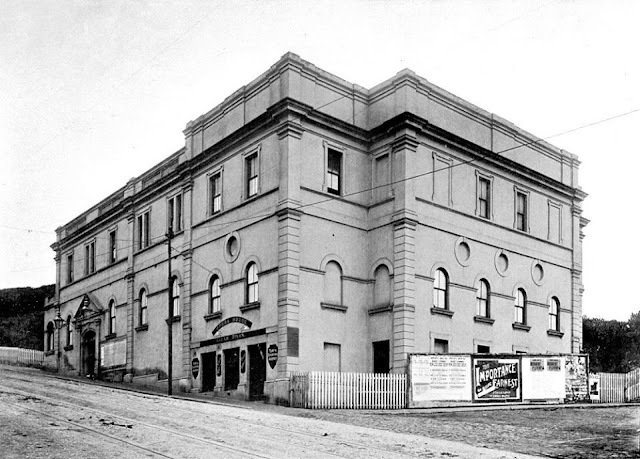 The first Greek Orthodox service in Port Elizabeth was held at St Peter's Church in South End in 1905 with the current site being purchased in 1956. 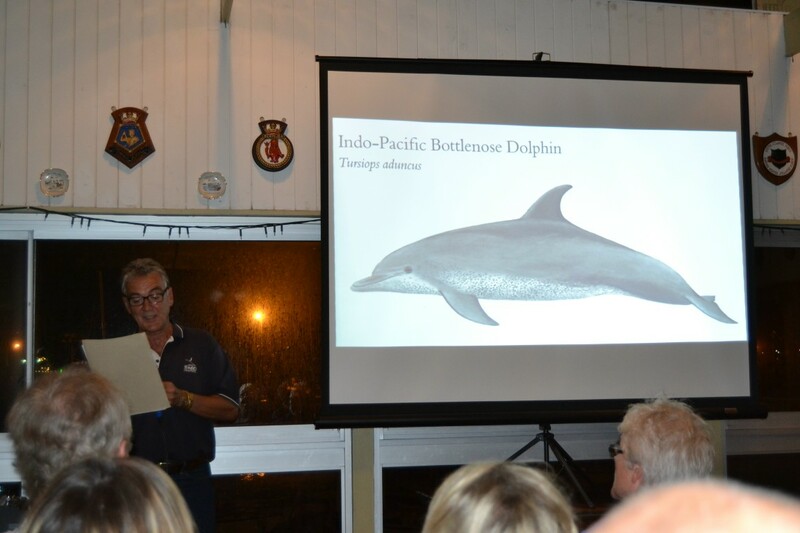 Last night I attended the launch of Port Elizabeth and Algoa Bay as the Bottlenose Dolphin Capital of the World at the Algoa Bay Yacht Club. The initiative was the brainchild of Lloyd Edwards of Raggy Charters and isn't sommer maar so. It's not like Lloyd just got up one morning and decided that he wants a new gimmick to promote the city and Algoa Bay with. The tag comes with some hard facts. Algoa Bay and the coastline around Port Elizabeth has close to 30 000 dolphins living here. That is more than in any other one place in the world. Over a period of 19 years Raggy Charters have seen dolphins on 90% of their cruises with pods ranging from 50 to 600 individuals. I thought it was going to be a low key event but around 250 tourism peeps, ocean lovers, conservation people and even scientists came together and packed the Algoa Bay Yacht Club's Chartroom and outside bar area. Wow, what a turnout and a good indication how much this means to the local community. Now for us to take this and send it out to the world. This is the SABC news article on the launch that aired this morning. Janine Lee doing an excellent job getting news from the Bay out there as usual. 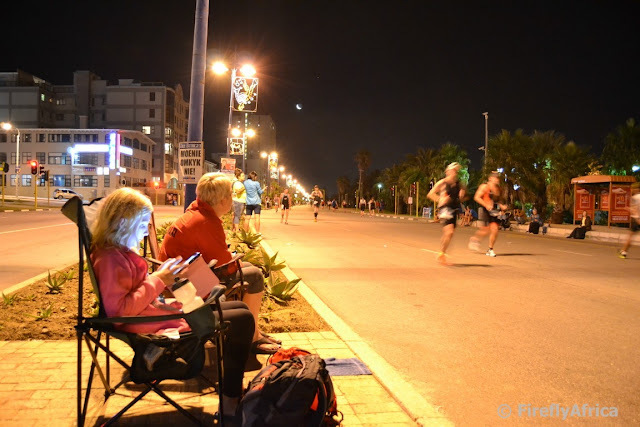 Last weekend with Ironman we headed down to the beachfront to support the runners and set up our spot in front of McDonald's. I don't think I've ever posted a picture of the Dolphin's Leap complex next to Bayworld and decided to snap a pic. Dolphin's Leap is made up of mostly restaurants and pubs with places like Cool Bru Beach Bar, Beer Shack, Gondwana, Raasoie, Nando's and Rocomamas as well as Surf Centre surf shop. A brand new conference centre is opening in the complex in the next week or two which will add to the business mix of the area. While on a tour of the Opera House a week or two (jeez, it could be three already) ago, I caught my friend - and fellow tourism peep - Seekoei taking in the view of the main auditorium from the stage while in deep contemplation. Wonder if there was a bit of a "wouldn't it be great to be on stage in front of a packed house" moment going though his head. Probably not, but still made a great picture. Earlier in the week I came across this awesome YouTube video on Facebook posted by Renaldo Gouws. Renaldo is well known for his political related comments but this time he sent his drone up to show off this beautiful place he (and I) call home. This particular video shows off a bit of the Kings Beach area and it would be great to see similar videos from him in future. No doesn't that just look inviting? And before somebody comments about the fact that the water is probably cold because there are all those people on the side and nobody in the pool. This was taken at the Ironkids event last weekend. The people are parents and supporters watching the kids in the water in the other pool. 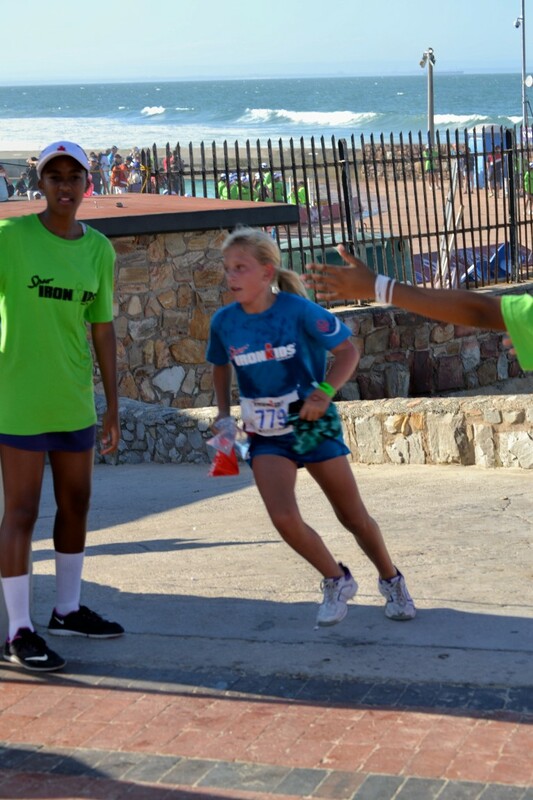 This is a scene that played itself off over and over at Saturday's Ironkids event. 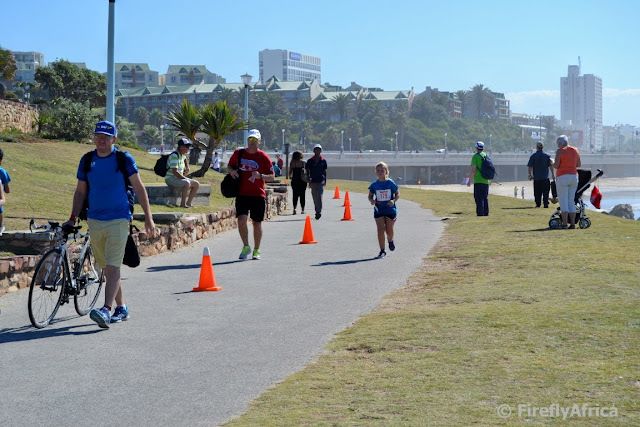 Fathers doing the run leg along with their kids (often with mothers a few steps behind). But if it only was as easy as it sounds. Most of us huffed and puffed along carrying bags and cameras, taking photos, encouraging the kids to keep going and sidestepping other parents and the general public along the way. Not quite as easy (or dignified) as it sounds. Specially when you're trying not to look like you're gasping for air or wiping the sweat from your eyes the whole way. One of the main reasons we wanted to go down and support the runners along Beach Road during Ironman was to cheer on four of our friends taking part. We parked our camp chairs in front of the McArthur pool complex and settled in for the evening. Our friend B had a tough time on the second loop of the bike so she was slightly behind the others but we decided to stick it out till she passed us the last time. 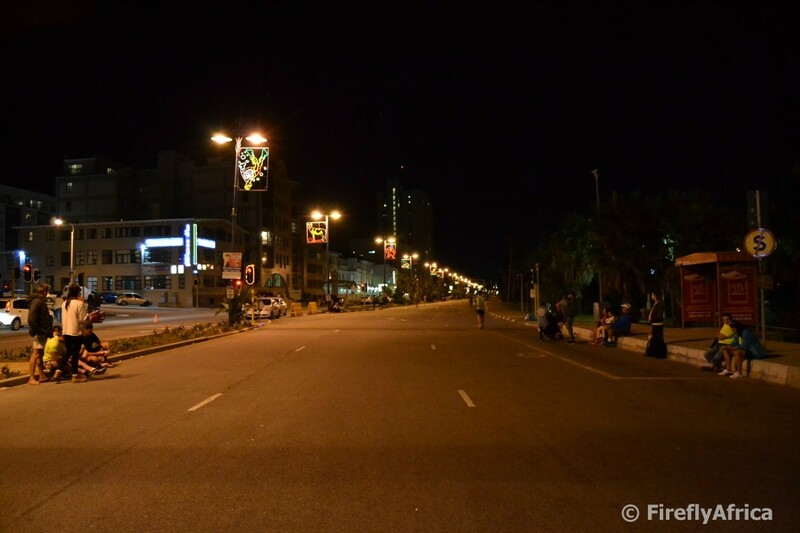 At 10:15 pm the road was starting to get a bit deserted. Only the last die hard supporters who still had friends and family on the road stuck around while the number of runners declined with every minute. B came by with a smile on her face and gave us the thumbs up. Only 6 more kilometers to go till the announcer would tell her, "YOU ARE AN IRONMAN!!!" which he did. Well done girl! After we spent most of the day on Sunday supporting the Ironman cyclists we headed down to the beachfront after dinner to spent some time supporting those same Ironmen and women on their running leg. Loved Die Burger's poster that said "Moenie omkyk nie" (Don't look back). I don't think I saw anybody look back. I think they are just too tired to care what is happening behind them. 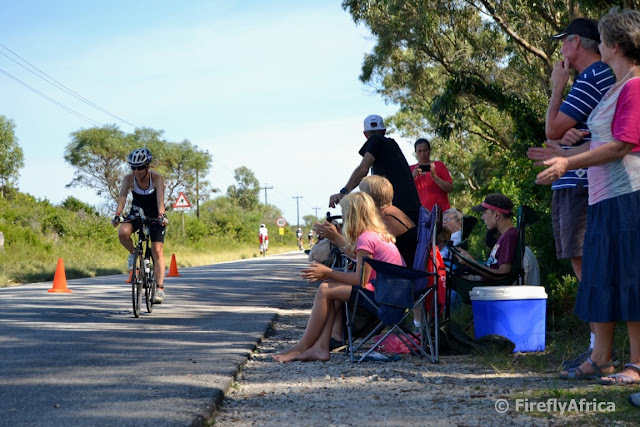 Due to the change of route for Ironman this year we couldn't watch the cycle leg from our usual spot next to Buffelsfontein Road at Mount Pleasant. After church this morning we packed our lunch in a cooler box, grabbed the camp chairs and headed off to the intersection of Victoria Drive and Sardinia Bay Road. After having to walk from the previous intersection because the road was closed way back there (with tons of tuning space and parking at the intersection we wanted to be at) we got ourselves a nice shady spot to watch the cycling leg on a sweltering hot day. But like a friend who took part said, rather heat than wind. Ironkids takes place the day before Ironman and consists of a swim and a run. 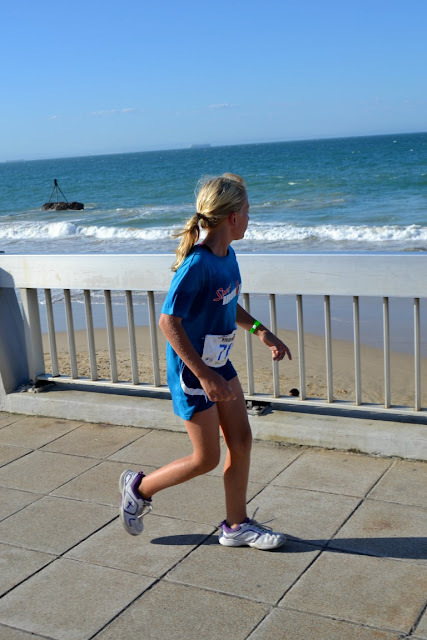 The Ironkids in Port Elizabeth is the biggest Ironkids competition in the world and would probably have been mush bigger if they didn't have to cap entries. 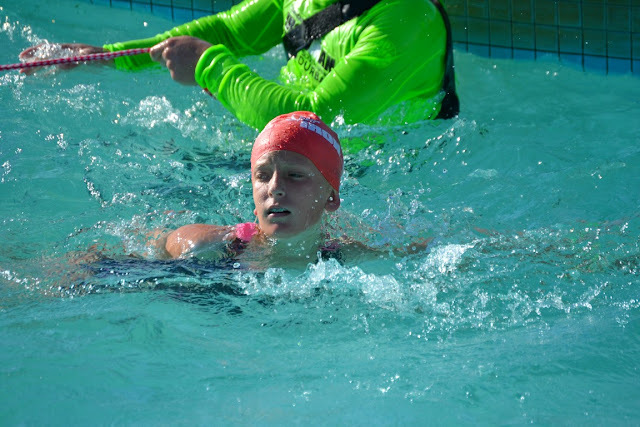 Drama Princess took park in her 5th Ironkids competition this year and had to do a 100 meter swim in McArthur Pool and then a 2 km run that ended on the main red carpet at Hobie Beach where the Ironman competitors will finish their grueling 3,8 km swim, 180 km cycle and 42,2 km run on Sunday. Chaos Boy didn't take part as he turns 14 on Monday and is just too old. Although Drama Princess loves the water, she isn't a great swimmer like a lot of the other competitors taking part and as in the past she just took it easy and did her swim under the watchful eye of one of the young lifeguards. 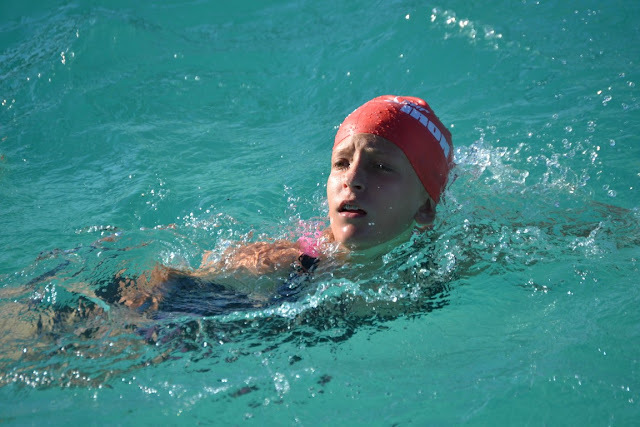 And here I want to give a huge shout out to the boys and girls of Summerstrand and Bluewater Bay Lifesaving Clubs who did an absolutely awesome job in the water assisting all these kids today. 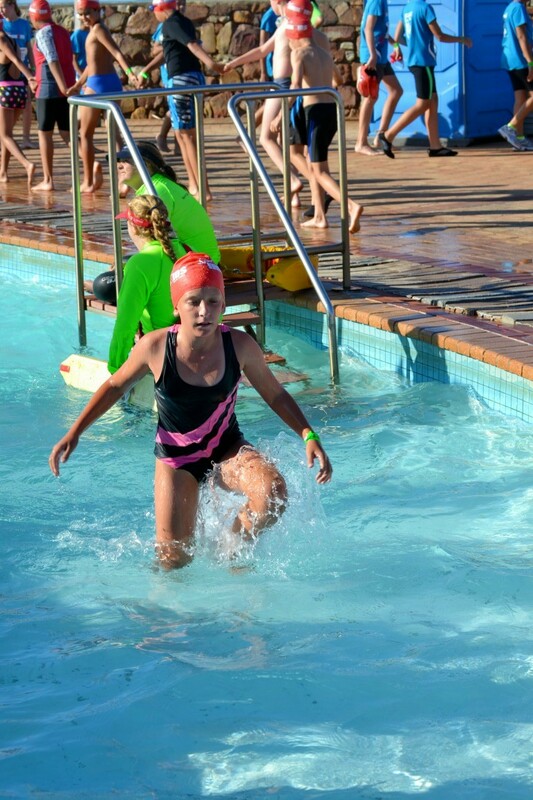 Running is what she does well and she more than made up in this discipline for what she lost in the swim. 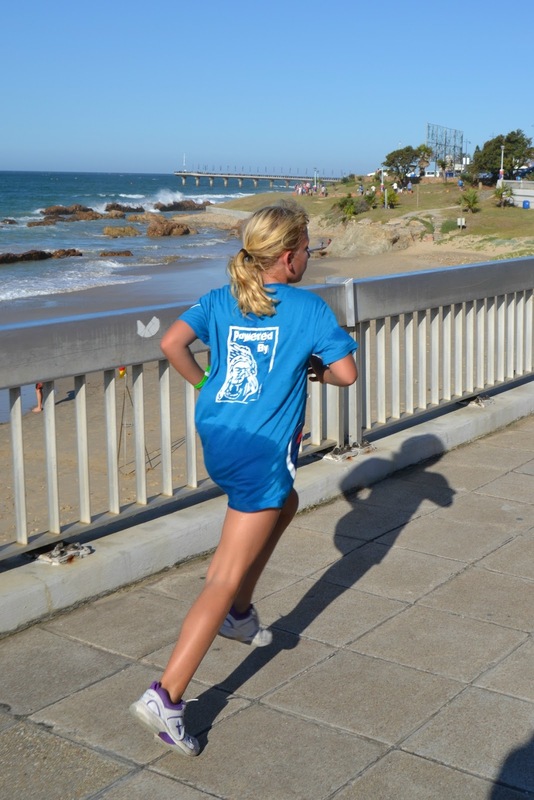 The run took them from the pool a short way back towards Kings Beach before tuning and heading for Hobie Beach. Still finding time to take in the view. Yes, Dad did the run with her as I always do. And with camera in hand. A quick smile with Dad taking photos with one hand and not looking through the viewfinder. Ironman weekend is upon us and tomorrow (Saturday 9 April 2016) we will be in the beachfront to support Drama Princess participation in the Ironkids event. 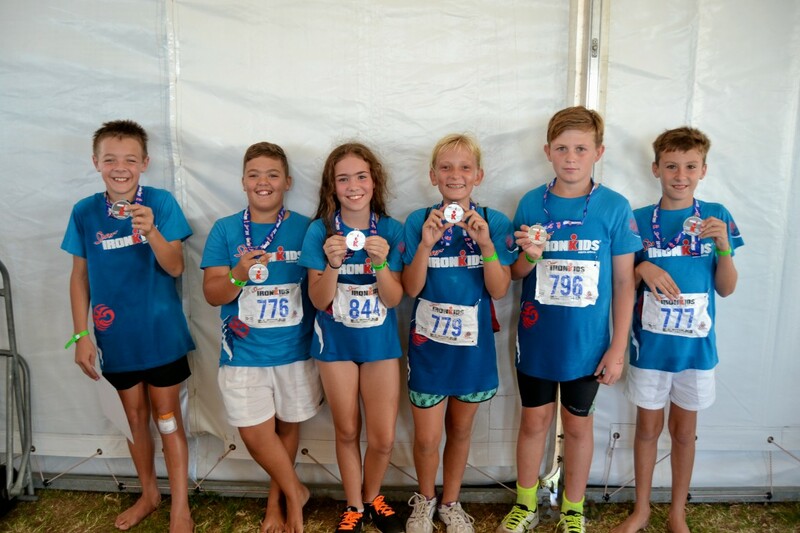 Ironkids take place on the Saturday afternoon and is made up of a swim in McArthur's pool and a run to the main Ironman finish line at Hobie Beach. The video I've posted is a highlights video from a few years back as I couldn't find one from last year. One of the new additions to the newly revamped Port Elizabeth Opera House is a stained glass window featuring the only three Africans on the continent to win the prestigious Tony Award – John Kani, Winston Ntshona and Athol Fugard. And best of all, they're all from our city. Forty years ago, the trio were nominated for the best play Tony Award, for their co-written play The Island. Kani and Ntshona both walked away with best actor awards for The Island and Sizwe Banzi is Dead while Fugard was later awarded a Lifetime Tony in 2011 for his contribution to theatre. Now the three legends are honoured and immortalised for their contribution to the arts through this magnificent stained glass window by David Manning at the top of the grand staircase in the foyer of the complex. When last have you attended a performance at the Opera House? Do you even know what it looks like in the main theatre? I am ashamed to say that I haven't been there for many many years, but I got to see it while on a tour of the facility last week. The curtain isn't the main stage curtain but the fire curtain, which they demonstrated to us. 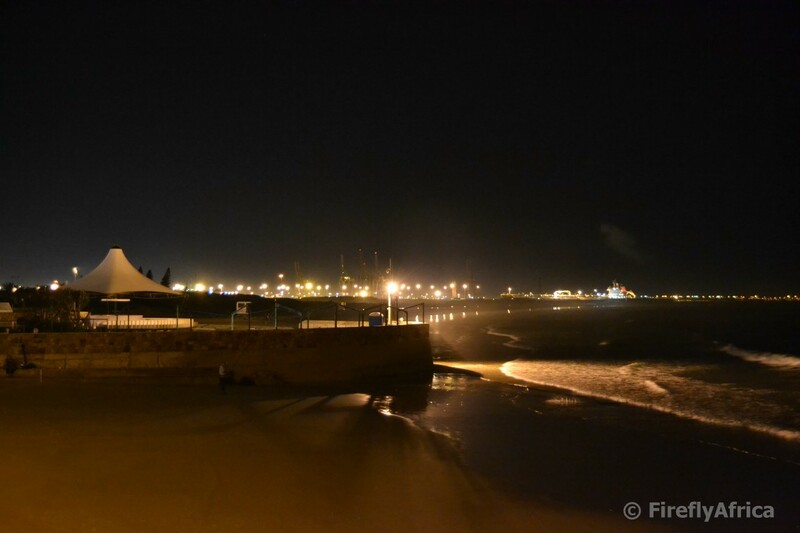 Yesterday's post was a Then and Now post featuring the Port Elizabeth Opera House. As the photo was taken from the street corner, the latest addition to the building wasn't really that visible so I decided to post a second photo. The wine coloured section is is the part that was built on to the original building in 1985 and was part of the extensive renovations that took place over the last year and was painted this was as part of the work. The glass section right at the end is a new addition to the building and includes a lift that means the Opera House is now fully wheelchair friendly. 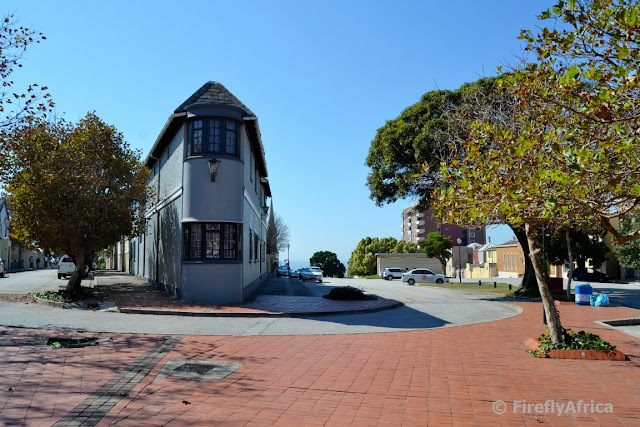 The first meeting to discuss a new theatre for Port Elizabeth took place in 1890 after which a company was formed, shares sold and a site was agreed upon with the Town Council. The building was designed by G.W. Smith and opened on 1 December 1892. The first lessees of the building was B and F Wheeler who also presented the opening performance of JM Barrie's "Walker, London". 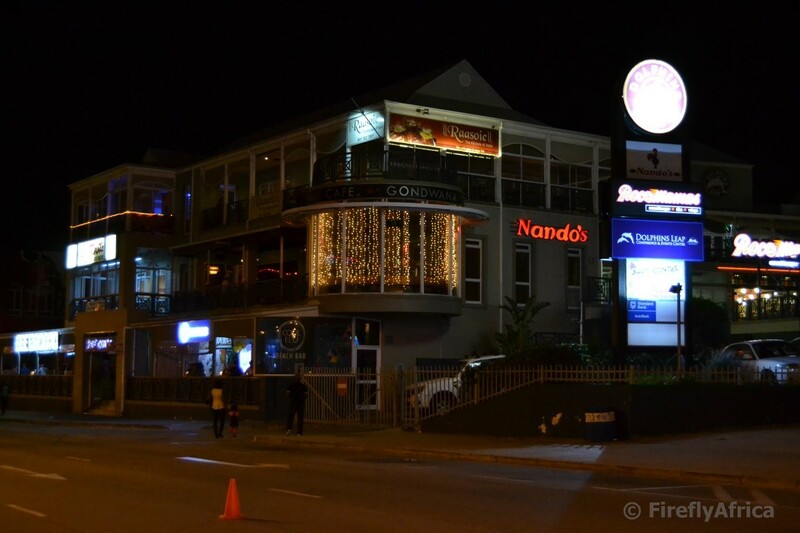 By 1916 the theatre was taken over by African Consolidated Theatres and they turned it into a cinema. In 1961 the Opera House was offered to the Municipality to use as a civic theatre, but they refused. 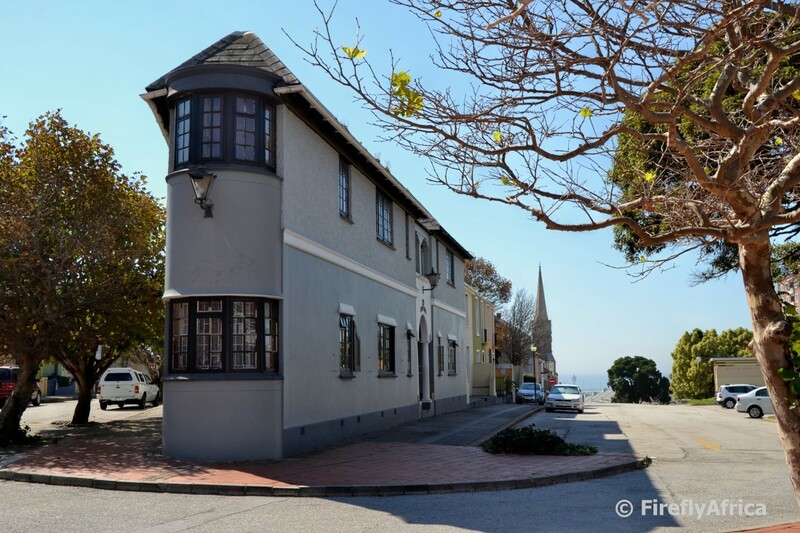 Five years later, in 1966, the Cape Provincial Administration bought and renovated it. The Opera House was extended in 1985 and had extensive renovations and another extension added in 2015. Today the Port Elizabeth Opera House is one of the oldest active Victorian Theatres in the world. Said to be the oldest in the Southern Hemisphere. There seems to be a coffee shop around every second corner these days, so you tend to look for the special ones. Last week I got to visit the newest one in town and it may just become one of those special ones. It is located inside the historic Athenaeum building in Central and is called Bakery Treats. I was there on the first day and they are still getting their ducks in a row, but they will be open 7 days a week, open late and serve meals so you could have dinner before attending a performance at the Little Theater next door. The 67 Beaded Quotes, part of Route 67, is also located inside the coffee shop as can be seen in the background of the picture. One of the Route 67 art pieces that gets the most comment from visitors is the taxis on the wall in front of the PE Opera House in Whites Road. The taxis represent the mode of public transport used by most South Africans. "History is often shaped by momentus events, while cities with their alleys, streets and avenues are formed by the layers rhythms of the daily necessity. This rhythim of place, shaped by the everyday, becomes the song of the city." 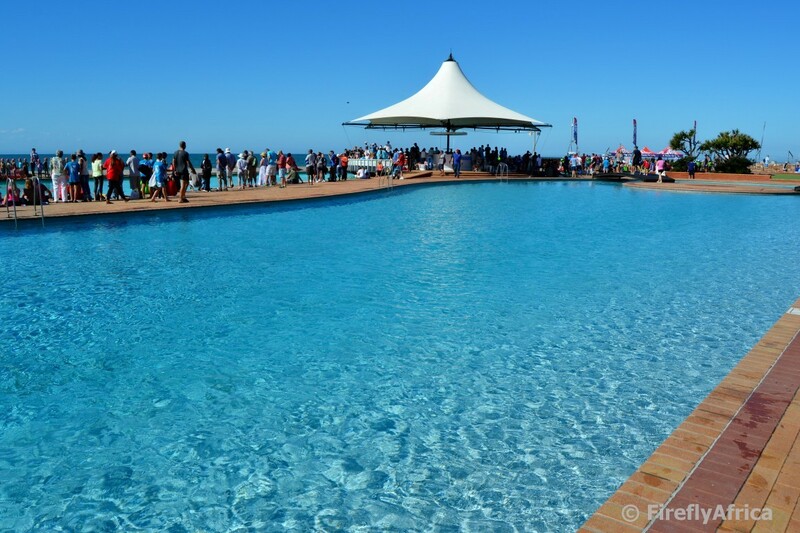 Next weekend the 2016 edition of the Ironman African Championship takes place here in Port Elizabeth. 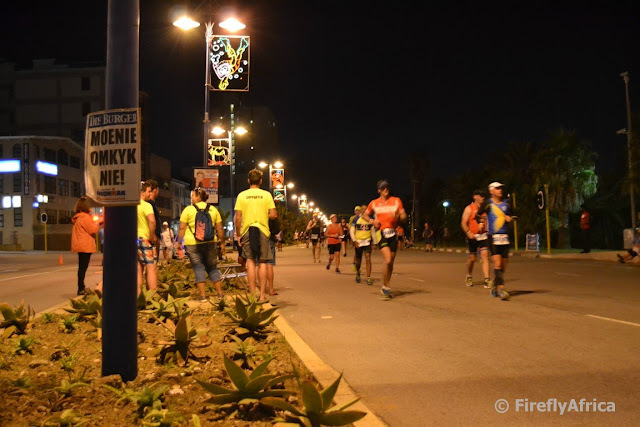 The Ironman vibe is going to be picking up around the beachfront and Boardwalk over the next week and to put you all in the mood, here is the highlights video of the 2015 event.